Brain dumps. Reports about experiments, ideas, and various stuff that's more useful on the net than written on paper stacked on my desk. they don't boot by default, it is mandatory to solder a number of wires and pull-up resistors just in order to get them to boot. Some vendors understood this and started to propose very nice development boards like the NodeMCU or Wemos D1. 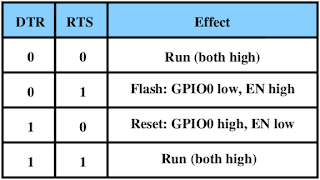 The NodeMCU clearly is too big to serve as a production model, but it exposes all I/O, integrates a USB UART, a "flash" and a "reset" button, and connects the UART's RTS and DTR signals to the RST and GPIO0 wires so that the programming software can automatically toggle these lines to program. The Wemos D1 provides all these features except the "flash" button, and is half as small. In fact it's only twice as large as the ESP12 module. This one may be used as-is for some projects. But both boards present a big problem : the USB UART cannot be disconnected and it draws a lot of power. So if you want to use these boards for production, you can only use them for mains-powered devices, not battery powered ones. Some people explain how to cut wires on these boards to reduce the power consumption but it's a real pain to do. Thus often you're back to using the raw ESP12 device as-is and solder the wires yourself. But then comes another problem : most USB UART devices adopt the now ubiquitous "FTDI" pinout, which exposes GND, VCC, RXD, TXD, DTR and CTS. 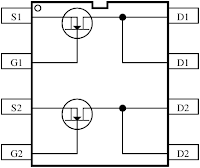 The problem is that while DTR is an output and may be connected to GPIO0, CTS is an input and you don't have another output to use to select between running and programming, so it's still required to plug/unplug wires during programming. 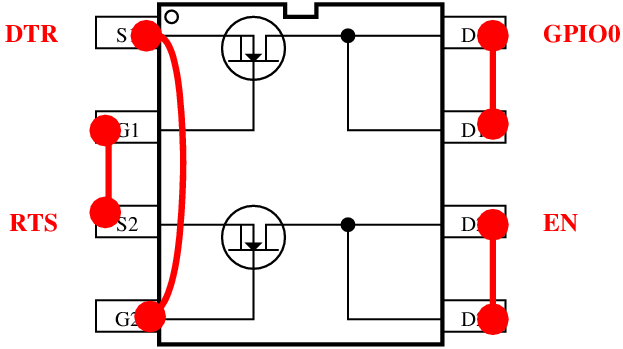 Some more advanced circuits implement an automatic RST+GPIO combo signal based on DTR only. But for me all of them have proven very unreliable, even after various modification attempts. First, GPIO0 sometimes emits a strong ~20 MHz signal preventing the DTR pin from going low and triggering the RST ; this does not happen while RST is held down however. Second, most often as soon as you open a terminal , DTR is triggered and resets the device again, which is not fun. Fortunately, during this time, RTS is low so it's possible to consider the combination of RTS and DTR instead of each individual signal. 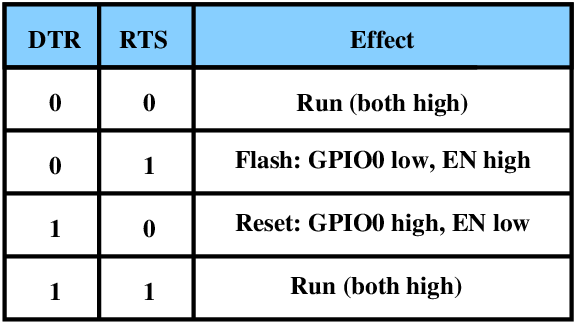 So as if it was not enough, DTR and RTS must not be directly connected to GPIO0 and RST, it's required to implement an exclusion between the two so that GPIO0 is triggered only when DTR is low and RTS is high, and RST is triggered only when RTS is low and DTR is high. 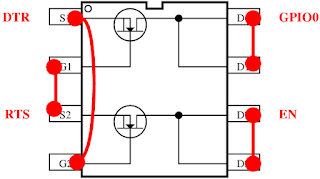 the serial connector must respect the FTDI-compatible pinout so that any adapter will fit at least to allow regular communication with the device, and emergency flashing by moving RST by hand if needed. 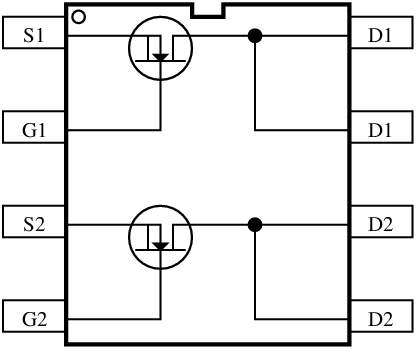 the serial adapter must provide the logic to combine RTS and DTR as described above. If small enough it can be placed on the final board, otherwise it's better to have it as an intermediary board. By searching for existing designs I found one part of the solution : Wemos not only does nice ESP boards, they also make an FTDI compatible USB UART on which you can decide to route RTS instead of CTS to pin 2. That confirmed to me that point 6 above can be addressed and become a prerequisite. I ordered a few and decided that in the mean time I'd modify my FTDI adapters. 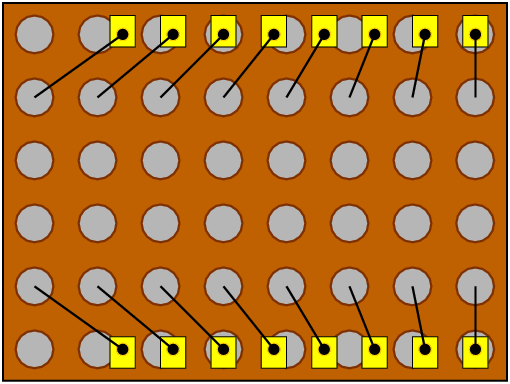 For point 3, I cut some experimentation board to the same dimensions as the ESP12, plus one row for an optional serial connector. It happens that the 8 pin rows on each side are the same length as the module once expanded to 2.54mm, and that exactly 6 pins fit in the module's width! 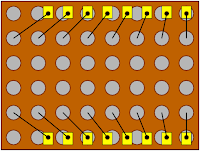 I decided to place 2.54mm male connectors in the middle, spaced by 7.62mm so that they can fit on the middle row of a breadboard and even in a DIL16 socket on any board. This left a central area where a few wires were routed and where there's enough room to install the pull-ups and pull-downs, addressing point 1 (I moved them elsewhere on this prototype as it was a pain to solder them after the connectors were in place). By placing the serial connector close to the antenna there's no risk of touching the SPI pins at the bottom. Also the antenna is generally supposed to be located in an accessible place so it makes sense to install this connector at the same place. It also turns out that it was convenient to route RXD and TXD. For point 5, I noticed during tests that a weak pull-up would still be better on RST otherwise it catches RF noise around (ie if you touch it with your finger). But that's a minor detail and doesn't prevent it from working. It's worth mentionning that if you don't see the pull-up resistor for the RESET pin on the photo, it's because I omitted it (as not strictly required), but I'll change this as the reset pin is now too sensitive to my finger, and I tend to reset the device when I touch it. I need to have RTS here. So I expected to be able to cut the PCB trace and solder a wire but I can't follow this trace which probably is under the IC so I don't want to damage my board. Instead I decided to proceed differently by using a 6-pin male-female connector to extend the existing connector, not connecting pin 2 to the adapter but instead cutting the other pins, bending pin #2 over the PCB and connecting it to RTS which is on the chip's pin #3 according to the datasheet. That's all! Now you have a modified FTDI adapter with RTS on pin 2! This modification is very simple to operate. However don't make the same mistake I did, you need to glue the connector once it works, otherwise it will come out of the adapter once you unplug the adapter and pull off your wire. BTW since I couldn't find a 6-pin connector, I had to cut a 8-pin one. In the mean time I found that Wemos proposes such an adapter on which pin #2 can be configured to be RTS or CTS, so I will probably not develop further on this adapter's mod. 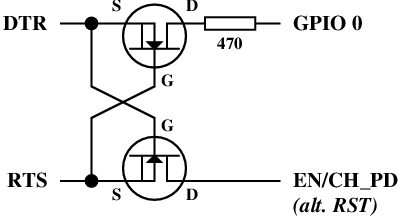 It's not practical to directly connect the signals to the board, it's required to implement exclusion between the signals so that when DTR is low but RTS high, the chip is forced to flash mode, and when DTR is high and RTS low, the chip is reset. Otherwise the chip will work in a single mode, or all software will have to be modified to consider your protocol. module and the ESP module. And it worked like a charm on first test! Now what is needed in the end ? After all these modifications, and after having found the Wemos serial adapter which supports RTS, I concluded that the only part which does not exist is the ESP module for end users. So in fact given that the dual mosfet above is very small and consumes zero power, it should fit on the small board I installed the ESP-12 on. This board would then be programmable and compatible with deep-sleep. Also, even smaller MOSFETs exist, I've seen some dual in SOT363 package. 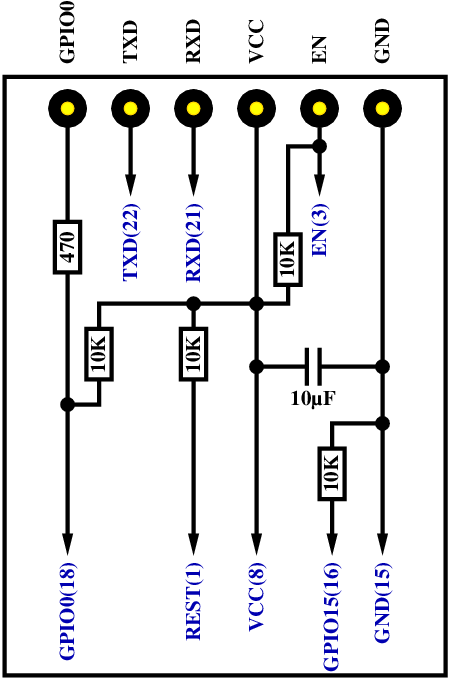 So by having just a board with 2.54mm pitch, the same pinout as the FTDI board for the serial connection, the MOSFET mounted and the few pull-ups, it would be possible to have the equivalent of the current ESP-12E module, but which could easily be programmed, either for development, or just for production. I think it should be sold with the connectors unsoldered. This way everyone can use it as a simple replacement for the current ESP-12 with a different pitch, yet program it and have it run by simply sending the power. Those who want to turn it into a development model can solder the two 8-pin barrels underneath, and it becomes compatible with breadboards and DIL16 adapters. Those who simply want the ability to reprogram it in field just have to solder the 6-pin barrel connector and they'll be able to plug their FTDI-like adaptor in situ to reprogram it. The best thing that could happen would be that some of the vendors like AI-Thinker create a new ESP module with such characteristics. It would solve all those issues at once. 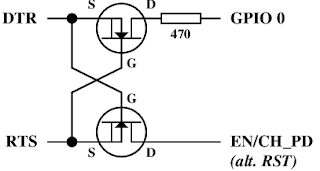 Right now when you look up "ESP8266" on Google image, you find tons of connection diagrams explaining how to flash them, which proves it's all but easy, or the NodeMCU models which provide the solution for development only. Let's think about it a bit further and make it usable for everyone! I'm not an electronician, just an occasional hobbyist and I could make it. But for people like me, it takes an amazing amount of time. Having the correct boards from the factory would be so much great!